During the 14th International gvSIG conference, held the next 24-26th October in Valencia, a free workshop about environmental modelling using gvSIG and the HortonMachine will be given. 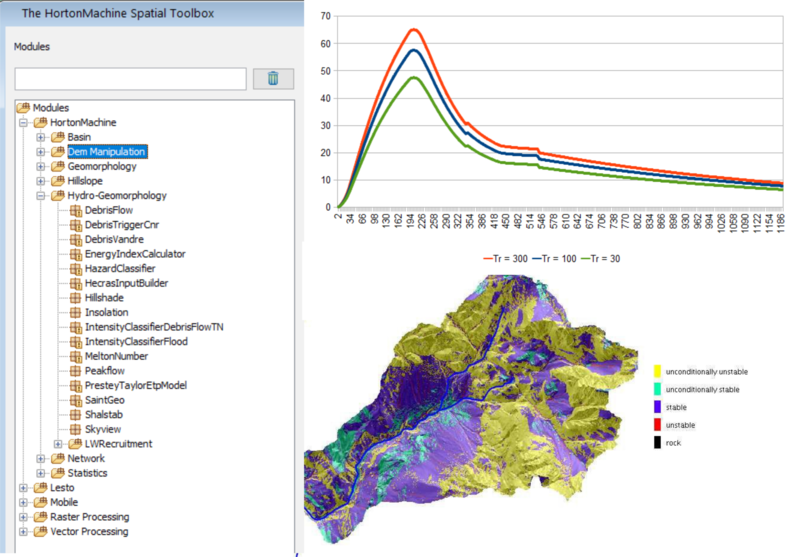 The HortonMachine library is an open geospatial library integrated in gvSIG containing tools for the management of environmental data and hydro-geomorphological analyses. The algorithms contained in the library are the result of more than 10 years of research, development and real application by different researchers and professionals working in the field of natural hazards. The tools aim to the evaluation of different environmental variables (rainfall, discharge, biomass, hillslopes stabilities, …) mainly starting from a digital elevation model (DEM). These tools are classified into 7 different sections, from data management (raster, vector and point cloud), data collection in the field, and environmental modelling in particular related to hillslope stability, floods, debris flow and transportation of wood during flooding events. These tools can be used for flood and shallow landslides hazard and risks zones as required by the national and international directives, in particular the EU flood directive. The workshop is a first introduction on the use of some of the tools dedicated to geomorphologic analysis and flood mapping. During the workshop the participants will be guided through the use of gvSIG on a test case covering part of the activities to be done to define the maximum discharge in a river for different return times following a new available tutorial. If you are interested in some environmental modelling please join us at this workshop! All the information about registration and requirements (cartography, installation…) will be available at this post soon. This entry was posted in english, events, gvSIG Desktop, training and tagged 14th International gvSIG Conference, environmental modelling, The Horton Machine. Bookmark the permalink.